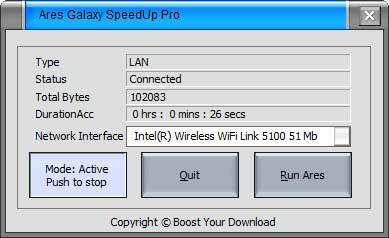 Ares Galaxy SpeedUp PRO is a powerful acceleration plug-in for Ares file sharing program. State-of-the-art software technology used by Ares Galaxy SpeedUp PRO generates dramatically decreases of downloading time. The add-on consumes very low resources from your computer and the nice and easy interface offers a great experience. NO Ads, NO Adware, NO Spyware, NO Trojans bundled! - Configuration from last run is saved and auto loads on start-up. The Solar System and the Galaxy are so beautiful that this screensaver creates. A fun arcade-style puzzle game for Windows. Qweas is providing links to Ares Galaxy SpeedUp Pro 2.5.0 as a courtesy, and makes no representations regarding Ares Galaxy SpeedUp Pro or any other applications or any information related thereto. Any questions, complaints or claims regarding this application Ares Galaxy SpeedUp Pro 2.5.0 must be directed to the appropriate software vendor. You may click the publisher link of Ares Galaxy SpeedUp Pro on the top of this page to get more details about the vendor.